Thank you for the Audience Feedback, or What are we Doing? That’s a great question. In fact, a big part of what we’ve been doing for the past year has been deciding what to do! Project: Project isn’t a model. We don’t fit three shows into our season. We don’t develop or interpret work that has already been done. We generate. Preparation for our first reading last August. We’ve been making and writing and improvising ideas surrounding “The Shiver Project” since November 2013 when our Core membership changed to include Alli, Nina, and Cecelia. There were days where we had insanely clear theses that we were about to chase down – hard! But then, well… “maybe-we’re-more-interested-in-this-idea” started to rear its head. While variations on our current theme were frequent in those early months, we’ve always come back to a few central ideas which our show is now based on. We had to remind ourselves that “no” is OK – especially in a group. That dissent is a part of ascension. That ideas are darlings that get to be cut, but their residue is still useful and affect our development. Every day we move forward, even if earlier that day we hit delete more often than any other key. Our individual strengths become our collective curiosities – what would this scene look like if… let’s write it! Let’s improvise it! Let’s take it apart and just write from the mother’s point of view. Whose story is it? Right! Working together means leaving behind inhibitions about opinions/ideas. Our motto: what have you always wanted to try? Is being fed right now. Just the act of collectively creating is something we’re all interested in trying. Sometimes it’s a great solution to writers block. We brainstorm together: “reasons why you might have an estranged family member. GO!” We’re also trying to challenge our artistic sensibilities by saying that shadows and whispers are our design inspiration… though at the same time we want our designers to pick up the mantle on this too! They should have license to be as creative and curious as we have been! So what is the Shiver Project? Brainstorming: no longer a solo process. We actually started with an unlikely prompt from an unlikely source. A friend of mine from Minneapolis had dropped this fairly obscure Grimm brothers fairytale in my lap called, “The Boy Who Went Forth to Learn How to Shiver.” The boy does not follow the typical path of a hero. He does not seek out fear to conquer it, he seeks it to understand it. This kernel jumpstarted our writing and started putting images into our head. We asked all kinds of questions: Why are there so many fairytales in the media? How can people just wave a wand or summon their mutant power and change their fate? Does our culture need to take charge of itself? What do fairytales tell us about ourselves? We’ve since drawn in ideas about modern fears and anxieties and thrust them into a character named Charlotte. Her academic, social, and personal pressures feed into her own anxiety, and parallel the boy’s lack of fear in (what we think is) an interesting way. We’re still learning from one another – and the show is still telling us what it is. 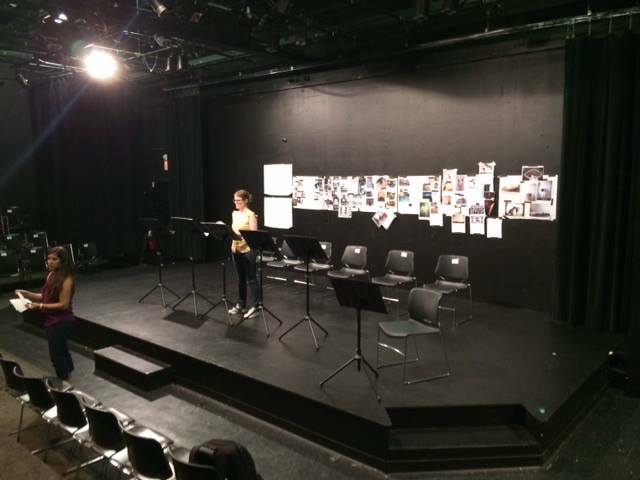 Thanks to a reading this past August an audience gave us some incredible feedback – that we are taking to heart (Thank You!). This week we had a breakthrough, a big, big breakthrough! I’d get ready for that next draft starting now!